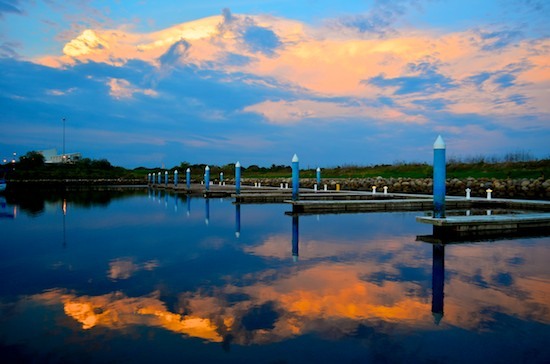 If you are taking your boat to Marina Chiapas, please visit our Marina Chiapas Cruising Guide for waypoints and travel ideas! October, 2012 – As we watched New Mexico’s unique Bisti Badlands disappearing in our rearview mirror, we began to focus all our energy on exchanging our US land travels by RV for our Mexico travels by sailboat. 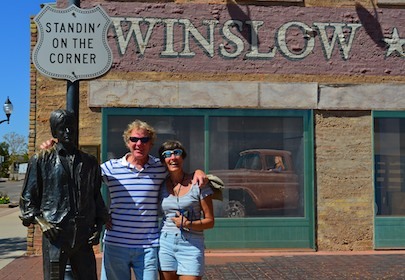 We breezed through Winslow, Arizona, just 24 hours after the conclusion of their big “Standin’ on a Corner in Winslow Arizona” festival, but we stopped long enough to stand on that special corner ourselves. Several weeks vanished in a flurry of visits with friends and family along with shopping for goodies we knew we’d need in Mexico but couldn’t buy there. We put the buggy away in storage and finally flew out to Tapachula near the end of October. 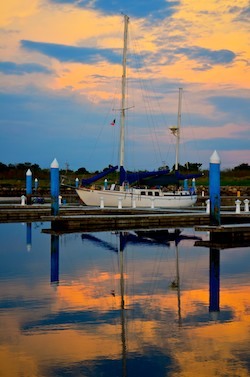 It took twelve hours of travel to get from our trailer’s door to our boat’s door, including three different planes and extraordinarily thorough baggage inspections before boarding each one. 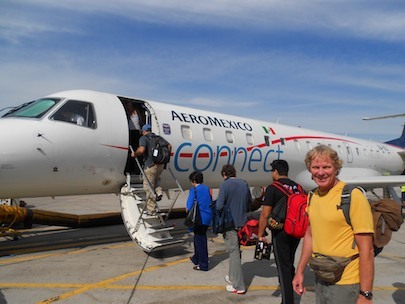 When we stepped off the last plane in Tapachula at 1:30 a.m., we felt like we were stepping into a sauna, and we were suddenly immersed in the thick, dense, pungent air of the tropics. Groovy was happy to see us. 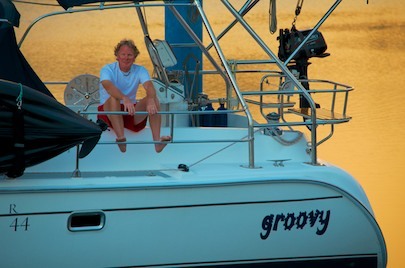 Groovy was waiting patiently at the dock, and even in the dark the boat sparkled, inside and out. 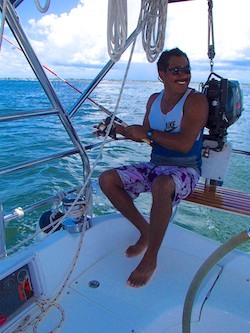 Our friend Andrés Reyes Prudente, the captain of a neighboring sport fishing boat, had taken good care of her during our absence. 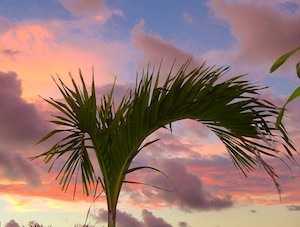 It was still the end of the rainy season in the tropics, and every day we were treated to fantastic clouds, a few showers, and even one doozy of a thunder and lightning storm that pelted everything with sheets of water and made us jump out of bed when a bolt hit somewhere very nearby. Of course, having just completed a long to-do list for the trailer in Arizona, we now faced another long to-do list for the boat. 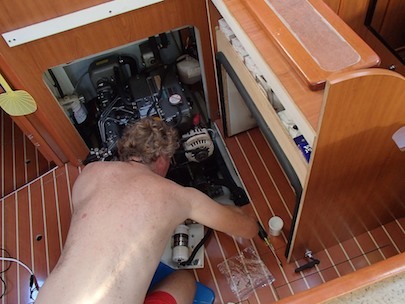 Mark leapt into action on the engine, and we ran off to super markets several times for provisions. Taking the “combi” van to Walmart, we found ourselves packed in like sardines as 23 people squashed into each other and sat on each other’s laps to fit into a van built to seat just 15 people. Ah, Mexico! As each person climbed into the “combi” van, they greeted everyone already aboard with a friendly “buenos días,” a practice we have seen over and over here. In my younger days I rode very crowded subway trains all over Boston, but I sure don’t recall anyone ever greeting anyone else with a big smile and friendly “good morning” as they got on. The intense heat zapped our energy every day. We don’t have air conditioning on the boat (probably a “must” both here and in the deepest of the tropics). The temps inside the cabin got up to 94 every afternoon. There wasn’t a breath of air. Sweat covered our bodies, head to barefoot toe, even if we sat motionless in front of a fan. 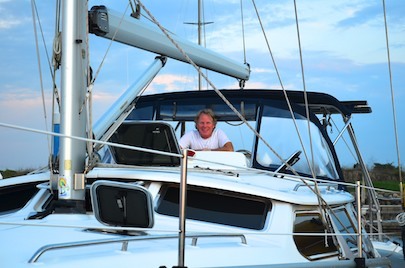 We hadn’t been on the boat 48 hours when we excitedly untied the lines and took it out into the bay to cool off in the ocean breezes and see if all the systems still worked. Andrés joined us, and he brought two fishing poles in hopes of catching dinner. The fish weren’t biting, but the ocean water felt great, even at 91 degrees. The Chachalacas (birds!) 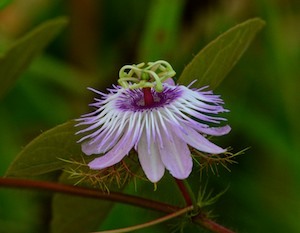 sat in the trees and made their funny bird calls at each other morning and night, and exotic flowers grew on their own among the weeds on the roadsides. 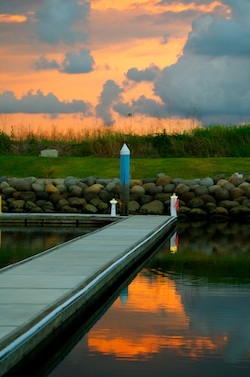 Every afternoon the sunsets transformed the marina and inspired us. 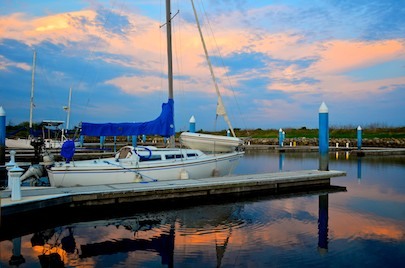 The fun thing about being in a marina like this is that everyone has a long to-do list for their boat, and sometimes you can abandon your own list to help a friend with theirs instead. 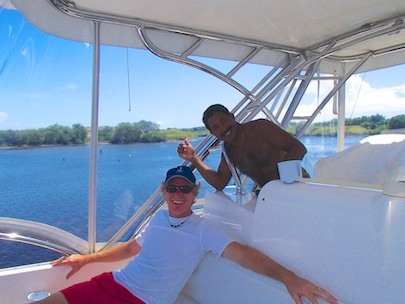 One afternoon Andrés needed to take his boat over to the fuel dock to fill up, so we came along for the ride to help with the dock lines. The fuel dock is tucked into a back corner of the estuary and it has grubby black rubber tires that put marks all over your white fiberglass when you tie up, so having some extra hands to help with the maneuver makes it easier. 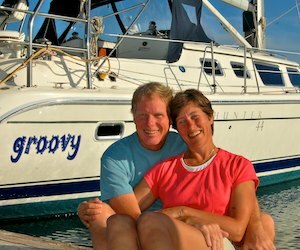 We needed to test some more systems on Groovy too, so off we went for another daysail in the bay once again. This port is a border port (just a few miles from Guatemala), so it is tightly controlled by the Port Captain and the Navy. 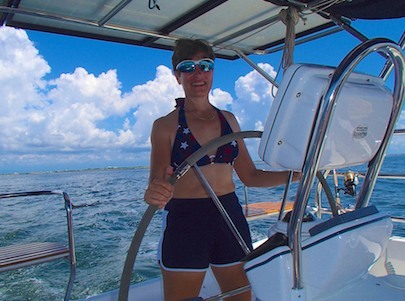 Every time we went out for a daysail, and every time we returned, we had to call the Port Captain on the VHF radio to let him know what we were doing. We are capable of doing this in rudimentary Spanish ourselves, but it was fun to turn the task over to Andrés and watch him rattle away on the radio on our behalf, giving the Port Captain all the detailed information he needed about our bay voyages. He also had success fishing that day, and happily reeled in a Sierra. 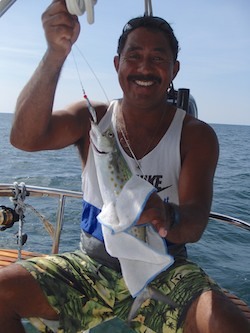 This pretty Spanish Mackerel is covered with yellow polka dots, and it made a yummy dinner. A small fish doesn’t go too far for three people, but a pile of tortillas and refried beans with hot sauce stretched it nicely. By the way, neither of us would have ever even considered eating those things with fish before living in Mexico, but when Andrés said, “no frijoles? ?” when he saw his plate, I quickly remembered what a great combo that is and warmed up some refried beans. We were slowly getting our Mexican vibe back. Groovy gradually came together, and the to-do list got whittled down to just a few items. 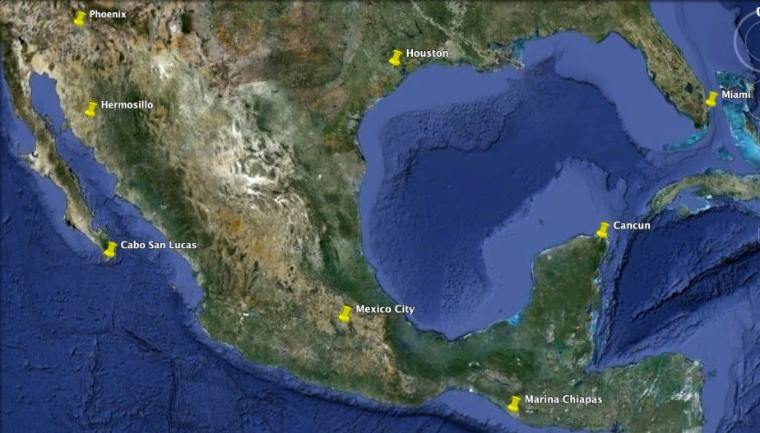 We had been watching the weather to see if a window would open up for us to dart across the difficult Gulf of Tehuantepec — at the same time that Frankenstorm Sandy swirled up the east coast — and eventually it looked like there might be a 12 hour window of total calm between the endless march of gales. But “Tehuantepeckers” had been blowing for a full week since our arrival, and they were forecast to continue to blow for the entire following week too. Good grief, what kind of crazy place is this gulf? 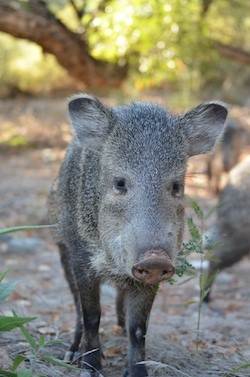 So, while we had hoped to take an inland trip to the local coffee plantation Finca Hamburgo for a few days, when the chance came to leap back into cruising and cross the Gulf of Tehuantepec, we grabbed it. 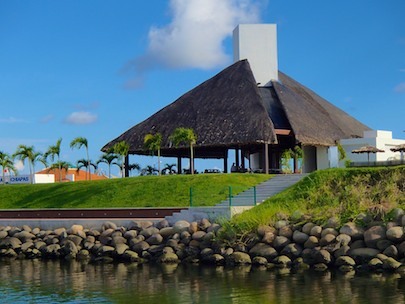 For waypoints and cruising notes for Marina Chiapas as well as an inland travel guide for what you can see OFF the boat in southern Mexico, please visit our Marina Chiapas Cruising Guide. 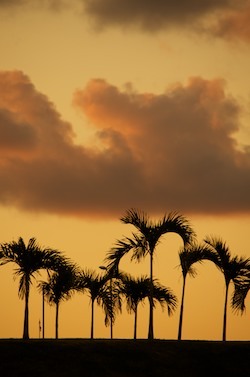 This entry was posted in Mexico's Mainland Pacific Coast (South) and tagged Chiapas, Chiapas-Coast, Mexico, Mexico's Mainland Pacific Coast (South), New, Travel, WP Travel by Roads Less Traveled. Bookmark the permalink.